These heavy duty doors are capable of withstanding 150mph gusts of wind, and are ideal for large openings up to 60 m wide by 12 m high. Each section is 230mm wide, ribbed and galvanised, and hinged vertically by a continuous hinge strip. Bespoke doors can accommodate cut outs for crane beams and monorails. Our manually operated roller shutters are ideally suited to individual applications, where the curtain door is manually raised via a continuous haul chain which drives a fully sprung counter-balanced barrel. For smaller applications, doors requiring no hand chain are available. Our electrically operated roller shutters come in two options dependent on height; tube operated up to 2.8m high, and over operated by a 240V Industrial Motor. Tube operated doors are ideally suited to shop fronts and other small applications, and can be operated by key switch, remote fob or access control. 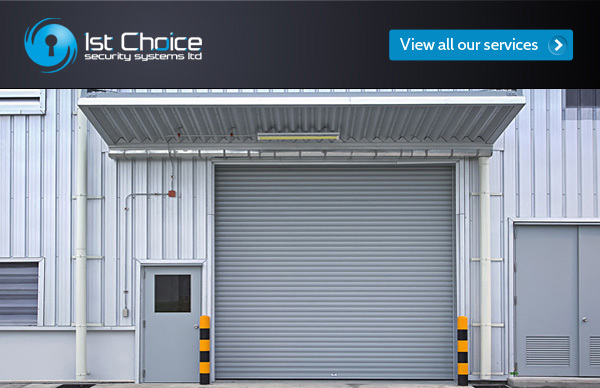 Industrial Motor doors are better for high doors that are in constant use, and can be operated by the same means as our tube shutters, or by a push button station. All our roller shutters are supplied with safety brakes as standard. Ideal for all warehousing, loading bays, insulated units or anywhere an aesthetically pleasing door is required. Each panel is 600mm deep, and are available in a range of finishes to suit industrial applications. Formed from two galvanised steel sheets, bonded together with high density polyurethane foam, our insulated door panels have a U value of 43 W/M sq, greater than building regulation requirements for external walls. Each panel fits flush, with a tongue and groove hinged joints, a compressible neoprene weather seal and white polyester finish both sides. A cost effective and simple way to reduce temperature loss through open doors. Strip curtains are supplied with all necessary track and bespoke steel work to suit your environment, and come in a number of different colours and sizes. Constructed from corrosion resistant Zintec sheets, using weld-free techniques, our Steel Security Doors are the ultimate solution to your site security needs. Available with various hardware and door furniture, including latch and top/ bottom panic bars, doors can also be finished primed or in a number of RAL colours. Suitable for domestic, retail and public buildings, our grilles are the perfect solution to secure your property’s windows and doors. The majority of burglaries involve using vulnerable windows as access points, so a 1st Choice security grille is the ideal solution to ensure all your access points are covered. Our grilles come in a variety of security ratings, and a number of finishes to blend in with any environment. Our manual push-up operation doors can fit apertures up to a maximum 12 sq m; doors above 12 sq m are operated by reduction gears complete with a zinc-plated hand chain. Our electric doors are operated by 415V geared electric motors, with low level manual disconnection for emergencies, complete with open and closed limit switches. The starter contains up-down and emergency stop buttons, plus a safety thermal cut out switch. In accordance with European industrial door safety standards, all doors are supplied and fitted with spring break devices and safety bottom brackets as standard, to ensure safe operation in the unlikely event that springs or wire ropes become damaged in the case of accidents.